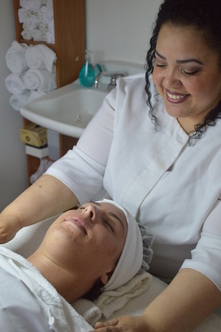 ​This deluxe facial consists of cleansing the face, neck and decolletage, skin analysis, appropriate mask for your skin type, steam to prepare the skin for gentle extractions, misting with a refreshing toner, hand and arm massage, massage of face, neck and decolletage and finally steam towels to soothe away stress. Warm herbal steam, exfoliation, and a treatment mask chosen specifically for your skin type and a relaxing facial massage. A relaxing experience that addresses a man’s special skin care needs, focuses on the prevention of ingrown hairs and razor burn. A perfect introduction to skin care for men. The skin renewal facial is for those clients that want to rejuvenate their skin. Recommended for mature or dehydrated skin. The skin renewal facial begins with exfoliation then a deeply, penetrating hydrating mask, steam, gentle extractions, toner and firming facial massage followed by a hydrating moisturizer and protective sunscreen. The skin on your back and shoulders should be treated with the same TLC as your face. Our back facial involves deep pore cleansing and steam to lift impurities, followed by gentle extractions, a specialized treatment mask and light massage. The Deep Pore Cleansing Facial draws out impurities, reduces oil without drying, and provides balanced hydration. Gentle cleansing, toning, exfoliation are followed by steam, gentle extractions and massage. Treatments for clogged pores first employ methods that emulsify the oil and debris that clog the pores. This eases the process of extracting the blockages without causing damage to the skin which can lead to scarring. Rich multi-vitamin firming mask exfoliates the skin while defending against free radical attack. Your skin will be cleansed, toned and refined followed by a facial massage and vitamin mask treatment, finally a moisturizer and SPF 30 is applied to help maintain and protect the skin's balance. Restoring the vitality of the skin through the use of enzymes, this facial is active yet relaxing. Combining natural fruit enzymes that digest dead skin cells while a nourishing masque formulated with antioxidants revitalizes the skin. This indulgent, deeply penetrating moisture surge facial will revive the most dehydrated complexions while your skin regains its youthful, suppleness. This soothing facial treatment is tailored for clients with rosacea or sensitive skin. This treatment reduces edema and dryness under the eye. Gentle massage of a concentrated serum lifts and tightens the delicate skin around the eye area. that easily absorbs hydrating nutrients. We use our hands everyday so a little pampering goes a long way!